Within the world of rugs and carpets if one is to mention ‘Tiger Rug’ the foremost thought aught to be that of Tibetan Tiger Rugs. Not because of any exclusive domain over the motif – which there most certainly is not, but rather because in the grand and storied history of tigers as inspiration for carpets Tibet has produced some of the most amazing, lively, and original versions of the design. Whether the motif originated in Tibet, in a geographically proximal region, or in Timbuktu as a metaphor for far-off unknown places, is a scholarly debate for another time. 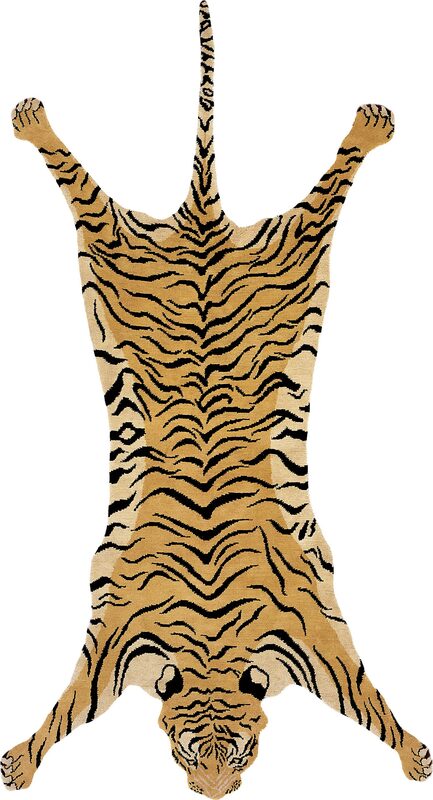 Regardless, know that amongst the collectable and pre-commercialized rug market, Tibetan Tiger Rugs are, if you’ll pardon the pun, the cat’s meow. Of course, we now live in the post-commercialization era and as such virtually all, no literally all, rules, suppositions, and assumptions regarding the fixing of a particular design to a certain region are to be disregarded. Rug and carpet designers can and do make whatever design seems to suit the whims of fashion in whatever region also meets such fickle demands. Thusly, this discussion shall not focus on the minutiae of antique Tibetan Tiger Rugs, but rather reference them as a highly influential benchmark and inspiration for the relatively recent and contemporaneous production of Decorative Tiger Rugs. 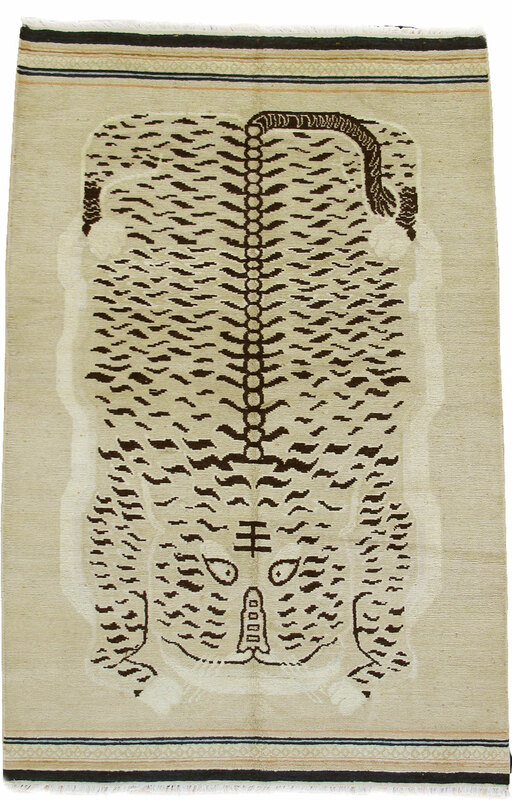 19th Century Tibetan Tiger Rug – Wool and Cotton – Purchase 1976 Charles W. Engelhard Bequest Fund – Collection of the Newark Museum | Image courtesy of the Newark Museum. As several tellings of the history of antique Tibetan Tiger Rugs go, the very first documented arrival of such a glorious rug in the west supposedly occurred in 1979 when one was purchased by and made its way to the Newark Museum in Newark, New Jersey. 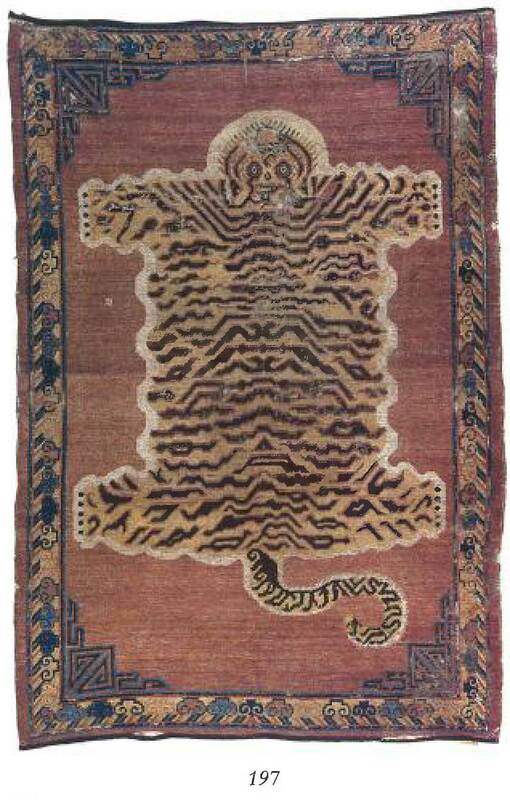 Though this date is oft repeated across many websites describing Tibetan Tiger Rugs utilizing virtually identical text it, on closer examination, appears to be incorrect. 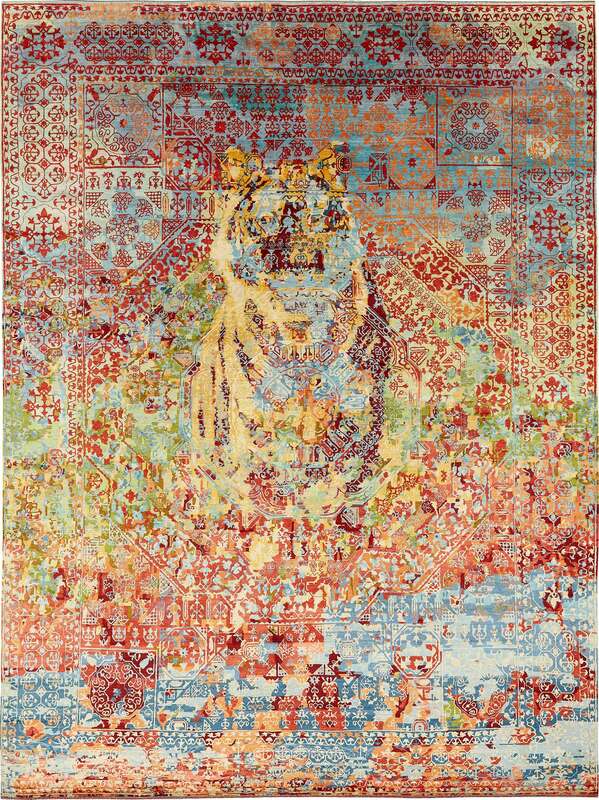 The correct date, according to the date of acquisition of the Newark Museum’s first Tibetan Tiger Rug, is 1976. I mention this seemingly innocuous inaccuracy as it perfectly illustrates our human fallibilities when examining events and items within our own lifetime, let alone that of centuries past. It should serve as a reminder that in absence of irrefutable proof, much of what we discuss regarding rugs and carpets – either academically or merely decoratively – is subject to the Sixth Opinion. To the Trade: When speaking of antique rugs and carpets much consideration is paid to both the origin and to the design, as those two (2) elements are often inextricably linked. As trade, and thus influence, spread around the world these two (2) components became less strictly tied together reaching the point today where – in new production – it is the exception rather than the rule. A design can be inspired by anything the world over, and often times the carpet is made where it makes most economic sense. Always ask about both the design and origin of the carpet. Tibetan Tiger Rugs of the antique and old variety can generally be classed into one of three distinct groups, though for pedantic reasons already mentioned, there are those scholars who further sub-categorize the designs; something I feel is a bit overzealous. The first general group then is that of what I consider the archetypal tiger rug: The ‘flayed’ style which – as the name indicates – depicts a pelt complete with arms, head, and claws attached. Second, is the ‘abstract’ style which portrays the stripe of the tiger in a more representative and conceptual manner and is the style to which ‘apparent modernity of their designs’ is in reference. The third is ‘paired’ which illustrates tigers walking in pairs; an apparent and direct result of Chinese influence representing Yin and Yang. Further sub-categories, if they are to be used, generally only add descriptors to these main categories, such as ‘realistic pelts’, ‘double headed’, ‘wavy stripes’, et alia. ‘Kitty Play Ball’ by Tufenkian – 100% wool handknotted in Nepal. | Image courtesy of Tufenkian. Dealers like the now retired Patrick Aaron of floordesign in San Francisco and the ‘late great’ Jackie Vance of Jacqueline Vance Oriental Rugs in New Orleans were two (2) such dealers making a name not only for themselves, but for Tufenkian and indeed tiger rugs. 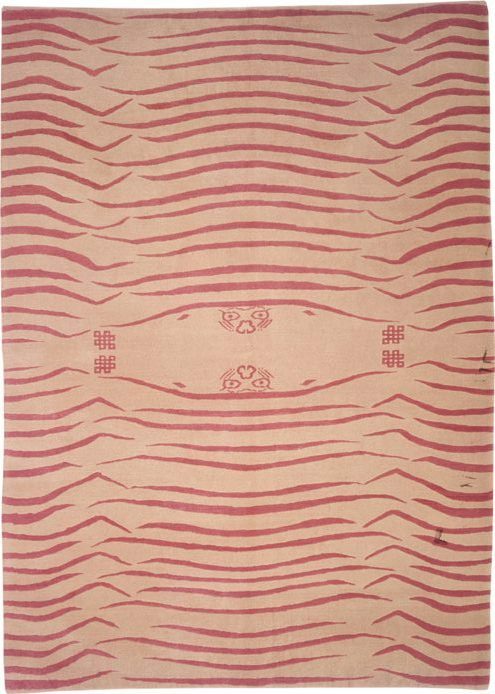 ‘When Patrick Aaron or Jackie Vance – two of the most generous rug dealers I have ever known – told every dealer they were acquainted with that the Tufenkian Tiger rugs are great, people listened. The Tigers sold through and the dealers kept selecting them for years.’ Tom says of Tufenkian sales at the time. ‘Takri 6’ by Odegard – 100% wool handknotted in Nepal | Image courtesy of Odegard. Takri by Kooches – 100% wool killim handwoven in Nepal. | Image courtesy of Kooches. ‘Takri 6’ by Odegard as shown above is an embodiment of abstraction with the notion of modernity heretofore described. Moreover, if one were to be pedantic the carpet could be further described along the lines of an ‘abstract double-flayed tiger carpet’, with the heads readily apparent and endless-knot motifs charmingly taking the place of the opposing front paws. To further the abstraction the design is reduced to a two colour palette well suited to the needs of the decorative market, eschewing a strictly artistic interpretation. In ‘Takri’ by Kooches, Tom DeMarco further attempts to abstract the tiger’s unchangeable stripes with an exceptionally minimal design whose origins could be all but unknown when examined in absentia of context. Tigris in colour Mocha by Tamarian – 100% wool handknotted in Nepal. | Image courtesy of Tamarian. 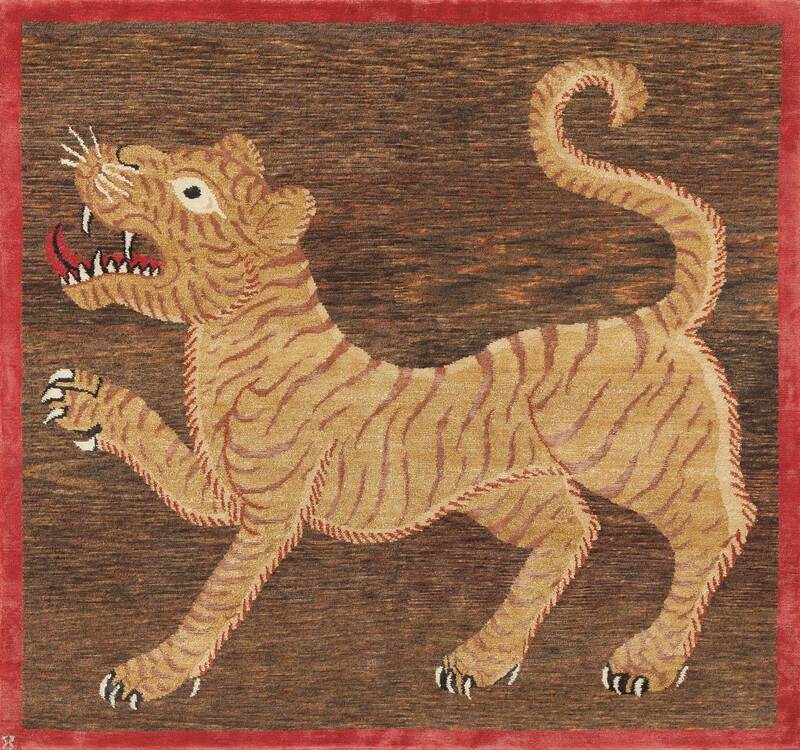 We reference this early work of Tufenkian and Odegard, plus the later work of Kooches to both draw the direct comparison to antique Tibetan Tiger Rugs styles and say this is what the first iteration of western influenced adaptation looked like: Highly recognizable as derivative of traditional Tibetan motifs and imagery. ‘Tigris’, as shown above, from Tamarian is a superb example of what I would call second iteration adaptation. The change in styling directly reflects western influences and decorative demands on the design and colouration. Its all-over patterning is very friendly toward furniture placement, the colour – while customizable – is presented in a very accessible palette, and it is a good looking agreeable to most carpet. 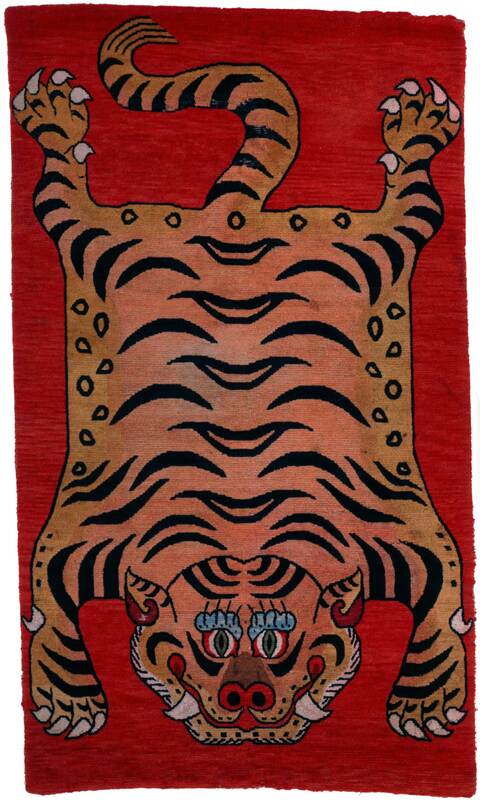 For purists like myself, it has not the charismatic ‘wow’ of other Tiger Rugs, but then again the vast majority of consumers are not purists, and therein lies the broad appeal. 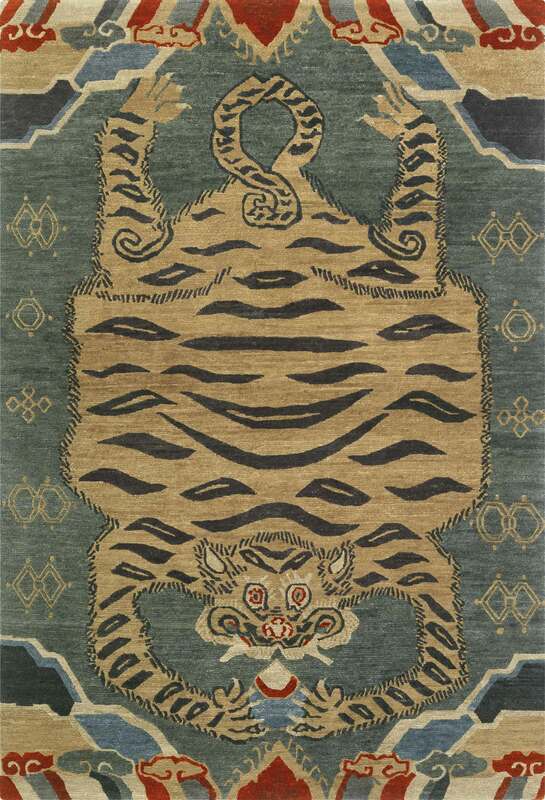 Tiger shown in colour Green by Joseph Carini Carpets – 100% silk handknotted in Nepal. 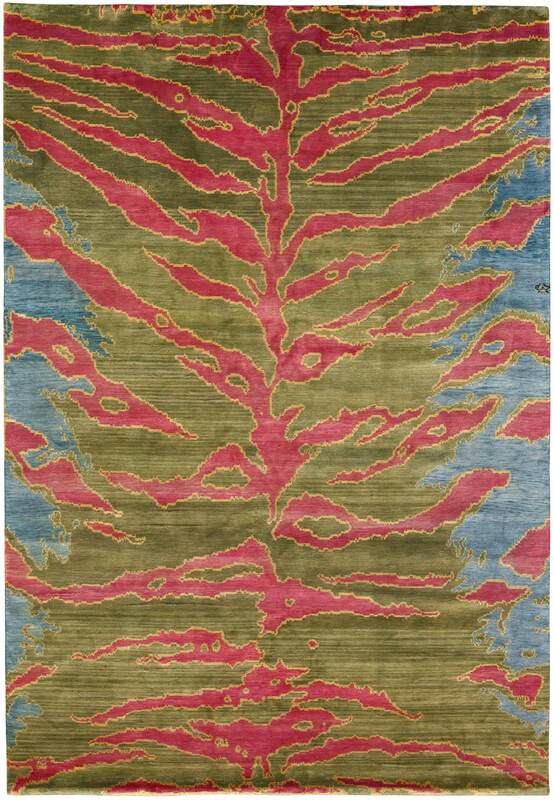 | Image courtesy of Joseph Carini Carpets. Khan shown in colour Ebony by New Moon. – 100% wool handknotted in Nepal | Image courtesy of New Moon. To the Trade: Perhaps at this point it is worth mentioning that due to the length of the discussion regarding the geopolitical circumstances of Tibet and China we have intentionally forgone mention of it to this point. In short, distinct Tibetan culture has, is, and likely will continue to be threatened by Chinese culture. Many Tibetans fled Tibet proper to Nepal after the Chinese occupied Tibet and took with them their artistry. Up to this point the discussion has focused on the Decorative Tiger Rugs made in Nepal as they are the most direct successors to antique and old Tibetan Tiger Rugs. As Mr. DeMarco so succinctly stated with ‘Tibetan/Nepalese rug making’ it should be noted the overwhelmingly vast majority of today’s – meaning from the late eighties onward – traditional Tibetan style rug weaving is made in Nepal and the two terms are unfortunately often conflated. That notwithstanding, the changes begun in the late eighties with the start of the modern carpet revolution continue to this day. The cycles of multi-cultural influence continue ever faster, and Tiger Rugs – in their various forms – continue to further evolve. As briefly mentioned earlier we had intentionally left open the debate on the origins of the tiger motif so as to spur conversation and thought regarding what importance that fact, if any, plays in today’s decorative and commercial driven rug market. 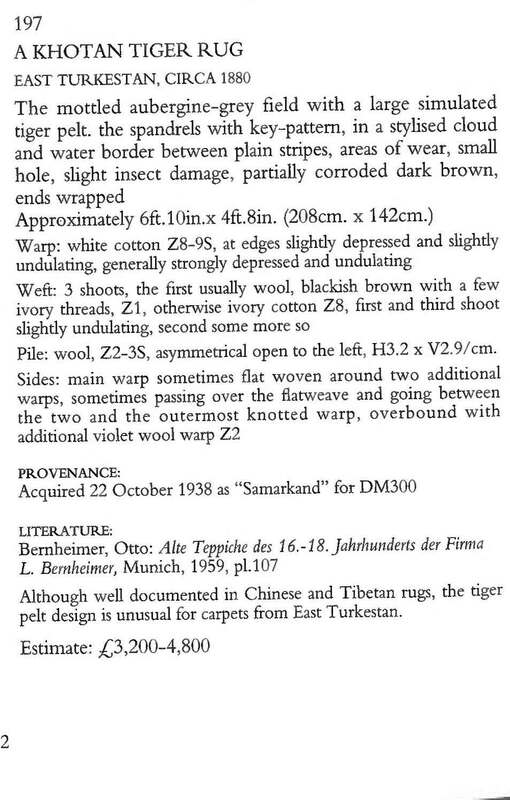 As noted in the description of the above 19th century Khotan Tiger Rug from the Christie’s 14 February 1996 catalog of ‘The Bernheimer Family Collection of Carpets’ sale: ‘Although well documented in Chinese and Tibetan rugs, the tiger pelt design is unusual for carpets from East Turkestan.’ So while Tibet and China may have long held a hegemony over the tiger motif, even one hundred years ago the design was being emulated, copied, or perhaps even just naturally inspired in the diaspora. 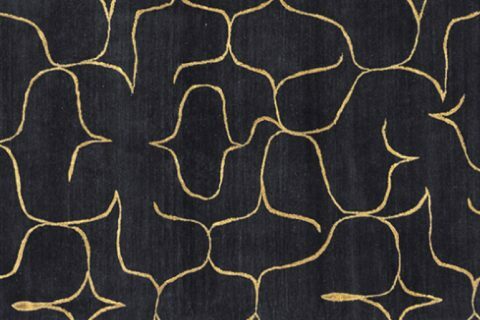 ‘Tiger’ from the ‘Wildlife Collection’ by Wool and Silk – 100% silk handwoven in India | Image courtesy of Wool and Silk. What makes this Tiger remarkable is that it represents perhaps the ultimate (so far) evolution in the Tiger motif. By combining not only iconography, design, materials, and workmanship from geographically disparate regions, but also abstract colouration and an artistic statement, with the modern computerized design technology that makes such work possible, this Tiger unifies all of the previously considered thoughts into one statement: Beauty knows no boundaries. 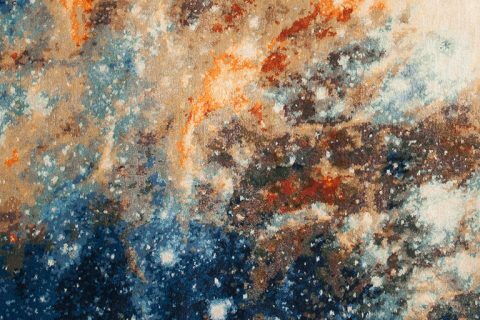 ‘Tiger’ from Wool and Silk represents the globalized state of design in 2016 just as ‘Kitty Play Ball’ and ‘Takri 6’ represent their time’s slightly less worldly and exotic nature. 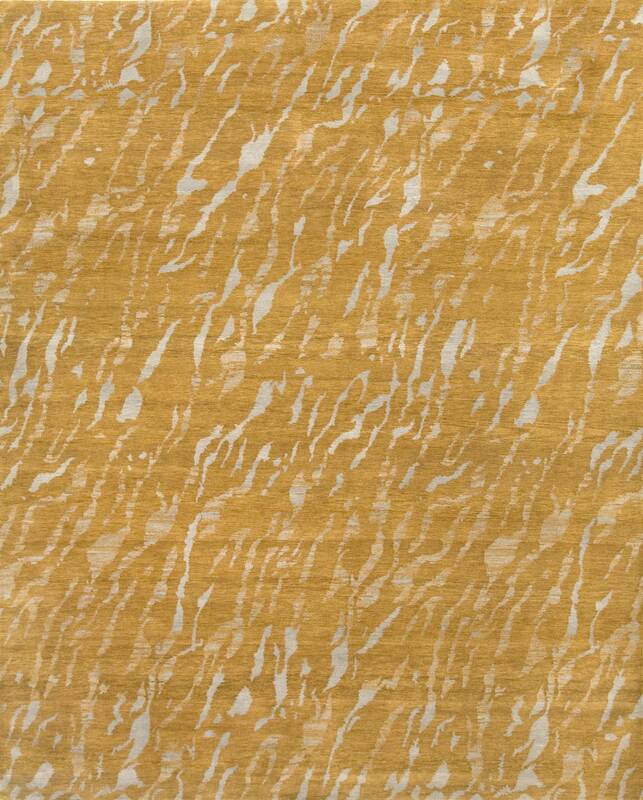 ‘Gorden Tiger’ by Odegard – 100% wool handknotted in Nepal | Image courtesy of Odegard. 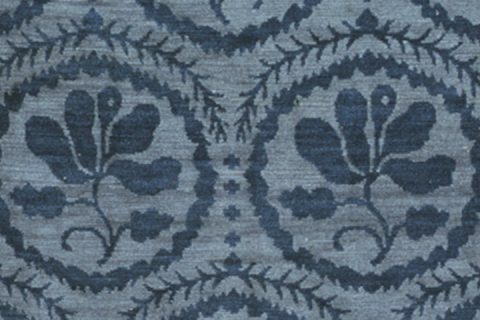 Gladys by Tufenkian – 100% wool handknotted in Nepal. | Image courtesy of Tufenkian. While beauty may be boundless, it is of course subject to the eye of the beholder, and as Erika Kurtz said of the tiger design, we now, once again, ‘come full circle’ to behold two (2) distinctly beautiful carpets. The Ruggist wishes to thank Joseph Carini, Tom DeMarco, Ryan Higgins, Erika Kurtz, Erbil Tezcan, and James Tufenkian for their contributions. Special thanks to Elisabeth Parker of Christie’s and to the Curatorial Staff at the Newark Museum. Wool and Silks’ ‘Tiger’ will debut at The Rug Show 10-13 September 2016 as will new introductions from Tamarian, New Moon, and Tufenkian. Odegard and Kooches will be showing concurrently at The New York International Carpet Show 11-13 September 2016. The work of Joseph Carini can be seen by visiting their showroom in TriBeCa.